Buttons are great, and you'd be surprised how easy it is to make your own, I'm not talking about the plastic ones, I'm talking chunky wood buttons, great as a feature on a knitted hat or some other item. 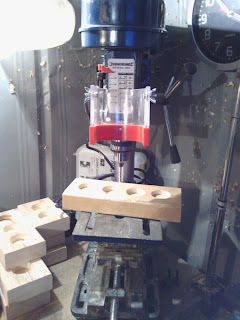 I use a post drill for making the holes in my buttons, but if you don't have one a cordless drill will work just as well, but be careful when drilling, and if you don't have an electric drill then a hand drill is just as good, but you will need a vice or some way to hold the button still whilst drilling. You can buy these quite cheaply. And obviously you need some kind of wood, sticks are easiest to work with, but if they are freshly cut it's best to leave them in the house some where to dry out a bit first. 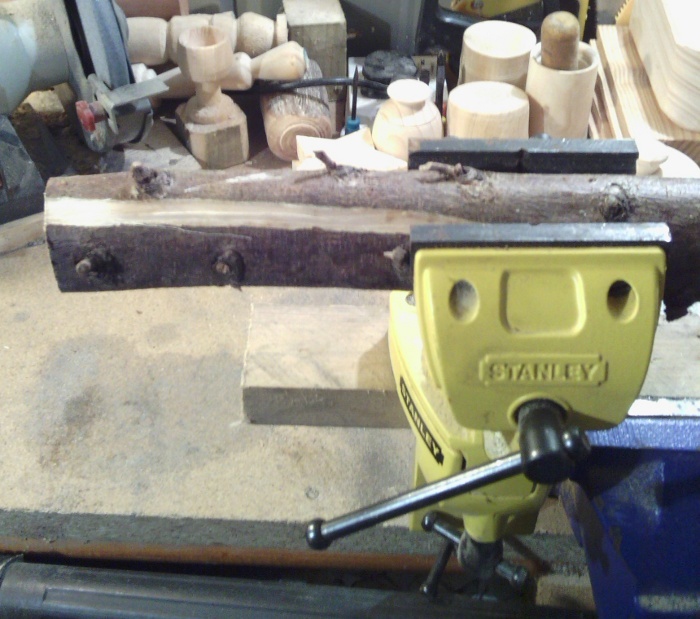 Then all you need to do is slice your stick up into sections as thick or thin as you want, although the thinner the sections the harder it is to grip them for sanding. Now if you don't have a vice you could use a strong clamp to hold the wood, but I'd recommend a vice of some kind, it doesn't have to be expensive, I have a hobby vice I use in my work room at the back of the house, it was less than £10 and is great for small jobs like this. Once you have some slices of wood it's on to the next step, and this is where things get personal, it's up to you how many holes you drill, where they are and such like, I tend to drill 2 holes in each button. They look a little rough, but they will turn out nice. 4 or 2 ? it's up to you. You don't have to drill the holes first, I do things this way because if the holes are a little rough they'll get sorted out when I finish the buttons, saves time and extra sanding. The next bit depends on what sort of equipment you have, if like me you have a variety of power tools then you may well have a belt sander or orbital sander, these will do for finishing the buttons as long as you use a fine grit (like 180) sanding sheet/belt if not then you can use a sheet of sand paper (again use a fine grit) and a wooden block, this will take longer, and probably make your arms ache a little, I use my lathe sander to finish the buttons, takes about 2 minutes (give or take) to finish a button. 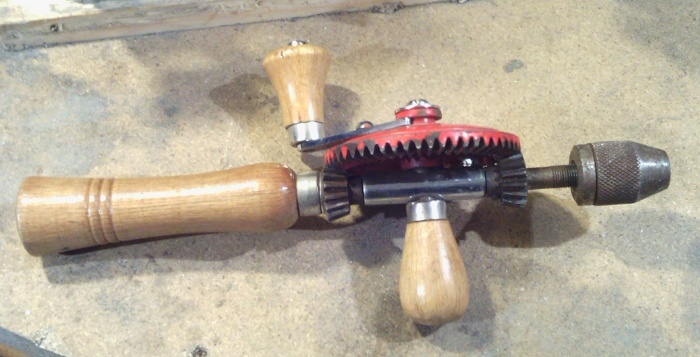 I built a sanding wheel for my lathe, I made a short video of me using it, please remember to watch your fingers if your using a power sander of some kind, gloves might be an idea, and a mask as things will get dusty. 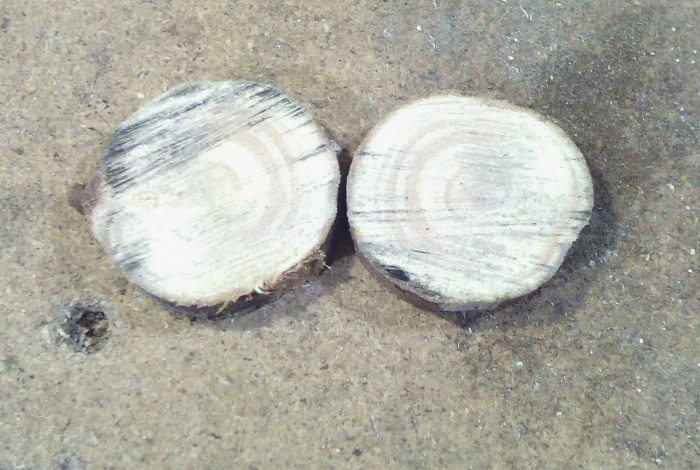 As you can see it doesn't take long, and apologies for the video quality, it wasn't as easy as I thought sanding and filming at the same time. 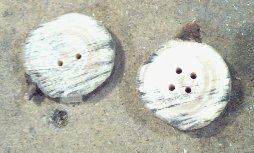 So once all the sanding is done you should have some nice smooth wooden buttons, they might be different sizes and thicknesses, but that just makes them more unique. I tend to either give my buttons a coat of beeswax to protect them without affecting the colour, or I use linseed oil, which brings out the grain quite well, but you could wax them,varnish them, or paint them. All done, 5 cypress & 2 pear wood. The pear wood is the darker one. You can see from the picture above that you can make the buttons as round as you like, or leave them a little less finished for a slightly more rustic look, and if this all seems a little like hard work then I know a chap who sells them in his shop ;-) which you can find here (opens in new window) I'm also working on a lathe jig that will allow me to make sets of buttons the same size and decorate the buttons with simple designs. Thanks :-) they do turn out pretty good. Oh wow, I love these!!! cypress and pear wood are beautiful. LOL, the first thing that came into my head when I watched your video was 'ooooh mind your fingers!' Hehe! Thanks, I do take a great deal of care when I'm using my tools, in 20 odd years I've only had 1 serious accident, I chopped of about 5mm of one of my thumb, just damaged the skin, so nothing lasting :-) needless to say I've not done it since. These are really fab, I've a real thing for buttons, and these are on a different level! Thanks for saying, they do turn out good, and they make nice features on hats and such like. I've seen some of the crafts you've done with buttons, very cool. Oh me oh my. Buttons from sticks? AMAZING!! Thanks, sticks are the easiest thing to use for buttons, I have plans to make sets of them on my lathe, just need to build some extra tools.